The highlight of the first Trainz Plus update is, without doubt, the new camera systems. We've unified the camera controls (and code) across Driver and Surveyor, provided improved control over camera movements, and added a range of new camera choices. With more options, more control over the cameras, and new transitions from one location to another, your Trainz experience is going to feel smoother. Drone camera lets you hover in a single location or attach to a train, Car cam lets you follow any of the Carz on the roads (but no internal view...yet ;), and you can smoothly change between certain camera modes by zooming in or out. Positioning your viewpoint for the perfect screenshot is easier than ever before, and getting into just the right position during a coupling operation is a breeze. We're really looking forward to the feedback during the beta so that we can make some final tuning prior to release at the end of the month. Since this is the first Trainz Plus update, we've prepared a set of Frequently Asked Questions to hopefully provide all the answers you'll need to know about Trainz Plus. 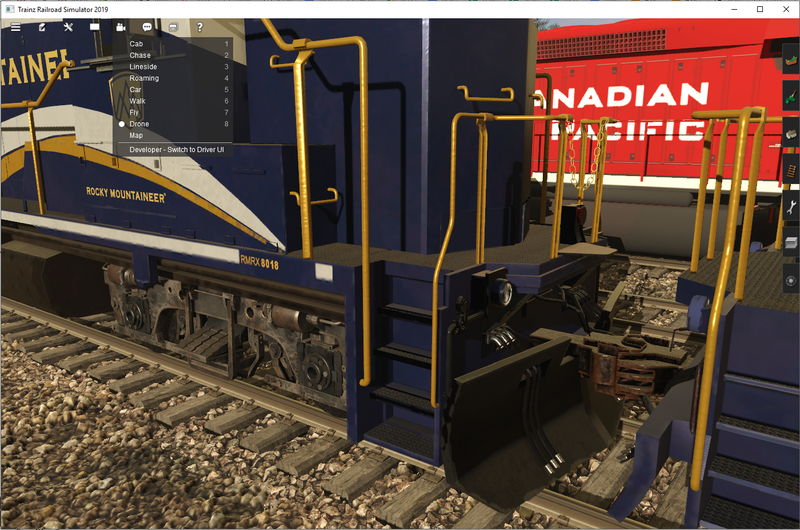 Trainz Plus is a quarterly update provided to our Gold Class members and includes a range of new features and sneak peeks at upcoming features we're working on. Most of the Trainz Plus features will find their way into future versions of Trainz. Please note that these are not replacing "Service Packs" and we will still be releasing free updates for Trainz A New Era and TRS19 owners. What is new in this Trainz Plus update? How do I get access to Trainz Plus Beta? If you are a Gold Class member, then just select the "Trainz Plus" update stream and patch as you normally would. Follow the prompts and click "Change Stream"
Select "Trainz Plus" from the list, then OK and Done. Now click on Check for Trainz Updates to patch. How stable is the Beta version? We have tested the build extensively, and we are not aware of any regressions from your existing TRS19 "live" version. That said, with the enromous variety of content, hardware, and usage cases, our beta testers usually manage to find a range of issues that we did not uncover in our internal testing. Can I wait until the official release version? Absolutely. There is no requirement to install the Beta version. When will non-members get access to these features? Any bug fixes (and some polish items) made for Trainz Plus will be released as part of a future Service Pack for TRS19. Most of the Trainz Plus features will find their way into future versions of Trainz. (Others may be replaced/removed/updated). Historically there has been a gap of two to three years between releases. Where can I find out more about the new features?